Since your vehicle is one of the biggest investments you will ever make, keeping it secure is extremely important. Essentially 100% of cars today are equipped with an alarm of some sort, and they do a pretty good job of deterring curb-side break-ins. A car alarm that goes off unexpectedly, though, is frustrating, and quickly gets tiresome. Here are some possible causes for why your car alarm is going off, and how to fix them. Key fobs are necessary for vehicle security, but a malfunctioning key fob can be a serious problem. 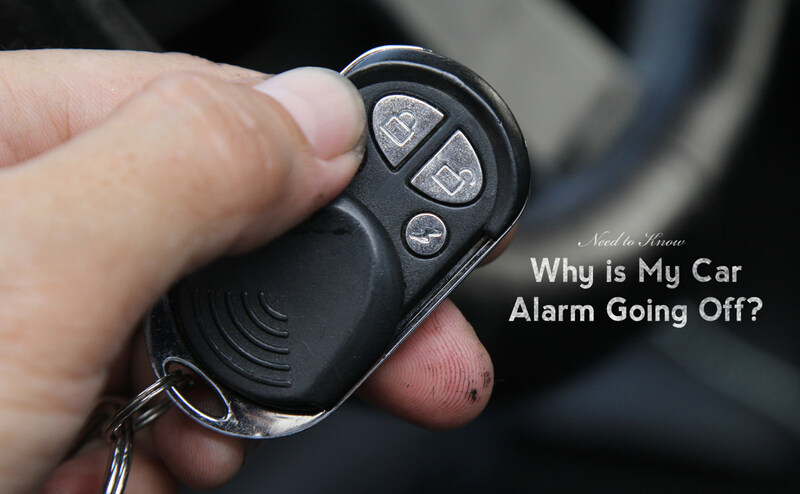 If a key fob or alarm remote is broken, it may not be sending a correct transmission to your car’s alarm system, which would cause it to go off. Consult you car’s manual to see what you can do to fix your key fob; often the manual will prompt you to replace the key fob’s battery, or instruct you on how to reset the device. Some auto manufacturers have a hood latch sensor that tells your car if the hood is open or closed, which helps protect your car. If the sensor is dirty, it might trigger a false alarm. Locating the sensor may sometimes be difficult. Some manufacturers have a micro switch inside the hood latch assembly. For aftermarket alarm systems the hood latch sensor looks like a small plunger with a wire, and is usually located near the headlights or radiator. Inspect it and, if necessary, give it a good clean. Dirt and grease can accumulate over the normal use of your car, and is easy to clean off. If cleaning the sensor doesn’t fix your car alarm problem, the sensor might be broken and an ohmmeter test would be needed to confirm if it is a faulty hood latch sensor. There are other causes, but this one is the easiest to try yourself. Some car alarms are designed to inform you of a weak battery. If your car is designed with such a system, your car alarm may be going off when you try to start your car with a weak battery. Use a voltmeter to check the voltage of your battery. The ideal voltage reading will be around 12.6 volts, so if yours is significantly off, you might need to replace your battery. Poor electrical connections caused by corroded terminals may be interpreted by your car as a dying battery, causing your car alarm to go off. Check the terminals of your batteries. Corrosion and dirt can be removed with a battery cleaner; make sure to use gloves and observe all necessary safety precautions. After cleaning, replace the battery and see if your car alarm troubles persist. We wrote a step by step guide on how to do this, and you can see it right here. Are you stuck with an alarm you just can’t figure out? Give us a shout and we can sort it out for you at the shop, and save you a big headache.